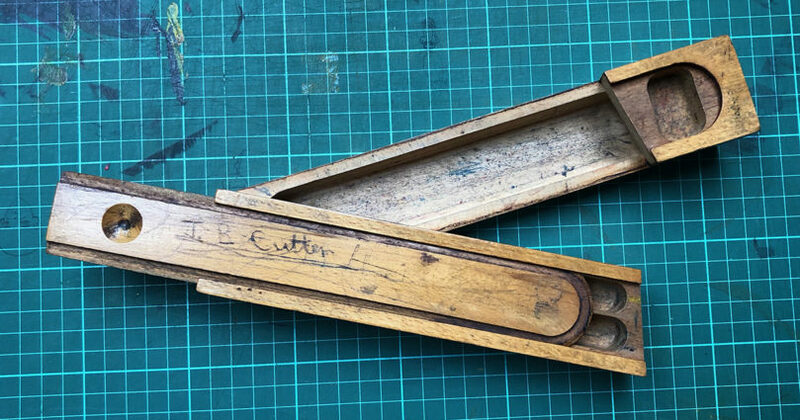 When I saw this retro wooden pencil box in a vintage market in Gloucestershire, I couldn’t believe my luck; I’d been looking for one for a long time! I used to have a pencil box just like this when I was very young so it immediately brought back a lot of memories. They were quite common then and several of my friends had them. This was before we all moved on to zip-up fabric pencil cases in bright colours or covered in the photos of our favourite band. Don’t judge me, I was young…! Look a little closer and it’s obvious that this particular box had a family history. On the lid you can clearly see that JB Cutter stamped their ownership on it, probably by pressing very hard with a pen. Look on the base, however, and you can just see a barely visible “Hilary Ann Cutter” written in green ink. Who owned it first? Were they siblings? Parent and child? We’ll never know but I love the thought that this item was passed from one owner to another, rather than just discarded when the original owner no longer wanted it. Is it me, or does the box look like it’s floating in these two photos…? There was a Hilary-ann P Cutter, born on 01/1954 Ealing Middlesex. Her mother’s maiden name was Wiseman. There is another child whose mother’s name was Wiseman; Jacqueline B Cutter, born 10/1950 Hammersmith Greater London. Perhaps they are siblings and the pencil box was handed down? There are several possible marriages for Jacqueline; the most likely is in Reading but there is also one in the Forest of Dean, Gloucestershire, which might suit your purposes better, if that’s where you bought the box. It is fascinating to speculate! I hope the original owner steps up and lets you know. It was bought in Stroud which isn’t a million miles away from the Forest of Dean, so perhaps it was the Jacqueline you found!